Genola Latte was established in 1970 by 4 founder members: the honourable Cavalier Giacomo Alberti, Mr. Egidio Frascheri, Mr. Bernard and Mr. Sicurtà. Its main purpose was not to produce cheese, but to act as a milk collection centre for the two companies Alberti and Frascheri, which were, and still are, suppliers of drinking milk on the market of the Flower Riviera, in the Liguria Region. 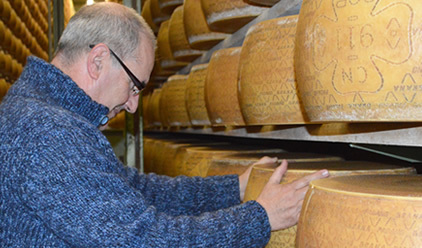 Here to tell us the story of Genola Latte is Gaspare Ramella, who has been working at the dairy for over thirty years and has experienced first hand the changes in the dairy company and also in Grana Padano production. In the 80s, the milk used to come from many small dairy farms. In the past, the dominant cattle breed in this area was the Piedmontese cow, which was not particularly suited to milk production, so we had to collect milk from many small farms in order to gather the quantity we needed. But the seasons were not all the same: in the winter milk production was low, whereas in the spring, when the cows were grazing in the pastures, we had to manage the surplus. That is how the idea to join the Grana Padano Protection Consortium and start cheese production was born. The dairy started out with 3 cauldrons in which cheese was made twice a day, once in the morning with the milk collected in churns the evening before, and once in the afternoon with the milk collected in the morning. The milk would be placed in pans so that the cream would rise to the top for subsequent skimming. Gaspare remembers very well when they switched from using the warm milk collected in churns to the cooled milk that came with the introduction of refrigerated trucks. He tells us that many people initially argued that using cooled milk would seriously harm cheese production, but they were immediately proved wrong because production results improved due to better quality milk. In the 2000s the dairy underwent revolutionary change once again: 12 more cauldrons were installed in the cheese-making room, bringing their total number to 20, and milk skimming silos were introduced along with many computerized procedures which enabled tradition to be combined with innovation, resulting in a better quality product and improved working methods. The milk surplus was in the spring, and on top of that there weren't many tourists in the Liguria Riviera so there was no need for so much milk. I remember there were 3 cauldrons and 3 skimming pans, and the cheese was made twice a day in each cauldron, once in the morning with the warm milk collected in churns the evening before, and once in the afternoon with the milk collected in the morning, and there was a cheesemaker who came from Carpi. We carried on like this until the 90s, then changes were introduced in the dairy, with 8 more cauldrons added to the original 3, and an air-conditioned room built to house the skimming pans to prepare the milk for cheesemaking. Another major change was when we switched from collecting warm milk to cool milk. According to the experts at the time that would spell the end of Grana Padano, but it was actually what saved us and enabled us to continue producing Grana Padano. Things basically remained unchanged from the early 1990s to 2003-2004 when the dairy underwent a revolutionary change: the number of cauldrons increased from 8 to 20, the milk was skimmed with a silo and the various operations performed by the cheesemaker became computerized. The cheese has undergone a radical change and there has been an unbelievable improvement in the quality of the cheese. This is all thanks to the foresight of Cavalier Giacomo Alberti, and it is due to him and his far-sightedness that I am here today. Since then we have carried on producing the cheese using this skimming equipment with a system for mixing the milk in the right quantities, checking the starter whey's fermentation activity and testing the quality of the milk. The method of production has radically changed. In the old days the cheesemaker seemed to be the offspring of some dairy divinity, today that has changed, there are production sheets to fill in, data to be complied with, and cheesemaking has become a more human activity. The cheesemaker is a technician, a good policeman who carries out his duty faithfully. 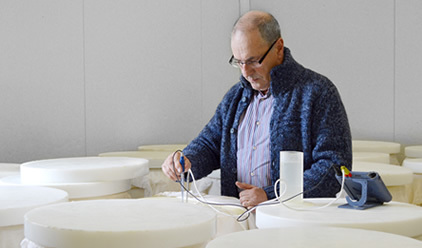 The manual work involved and the strong ties to tradition are still there, but the role of the cheesemaker is no longer what it was in the past. We, moreover, are located at the very edge of the area of production. Even though our production activity is small, small is beautiful. 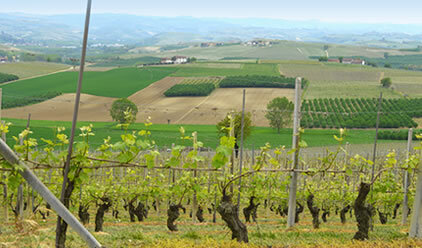 The milk producers who supply the milk to us feel proud to belong to the Grana Padano Consortium. previous: Franzoni F.lli Società Agricola S.S.
next: Giulia snc di Lavarini Giuseppe e Roberto & C.